We’ve talked about why we trade the S&P500. Here’s a step-by-step guide on how to trade E-mini Futures. 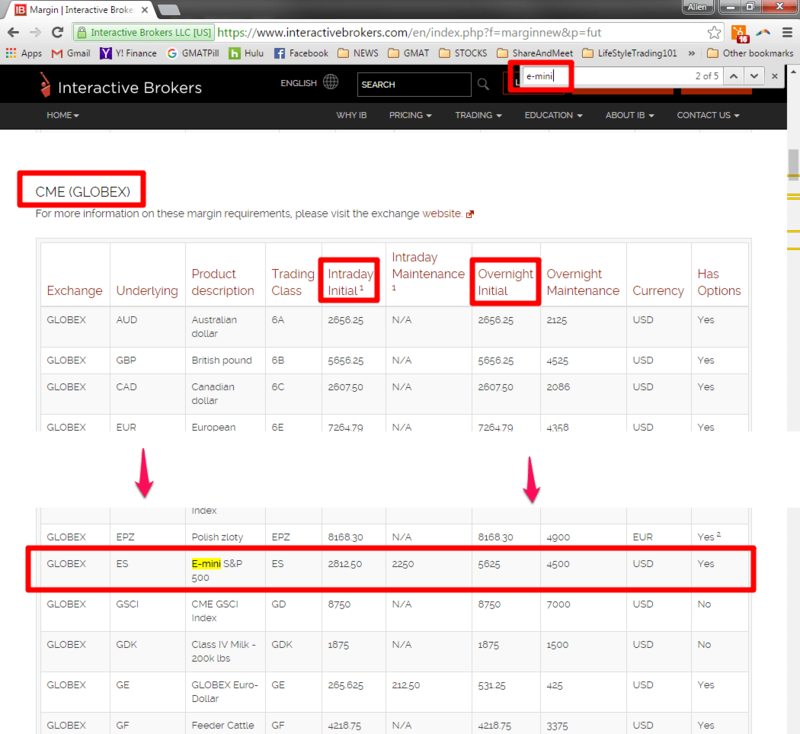 In the example above, we use the Interactive Brokers mobile app. But all major brokerages that support options can do the same thing (ThinkOrSwim, E-Trade, TD Ameritrade, etc). 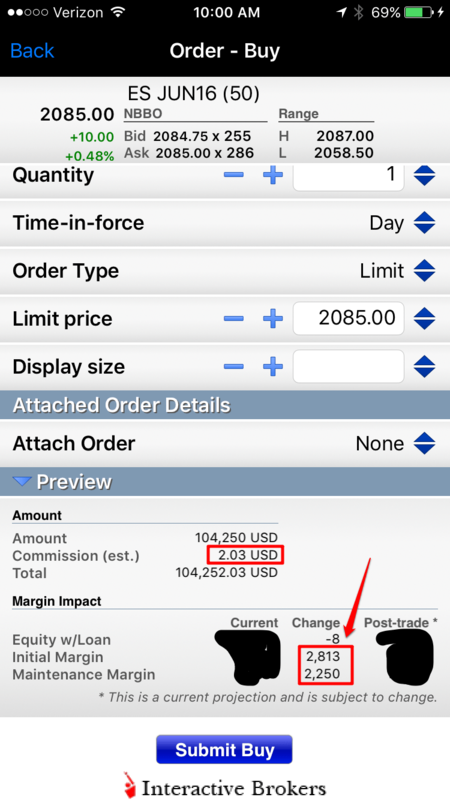 Each futures contracts eats up about $4-$6k worth of margin in your account – depending on whether you hold overnight or not (past 4:15pm). So for the cost of $2 in commissions, you can risk $4-$6k of your account to get control of $100k worth of S&P. So if the S&P goes up 1% and becomes $101k — you just made $1k on your ~$5k margin investment — that’s a 20% return on capital! However, note that the opposite can happen too. If the S&P500 is down by 1% and becomes $99k, your $5k becomes $4k and you will effectively be down by 20%. Worse, you could even lose all your $5k AND owe your brokerage additional money if that $100k of S&P that you control dips below $95k on any given day. With futures – there is daily settlement – so it’s not like in real-estate. In real-estate, if the value of your home goes down by 5%, you don’t have to realize that loss. As long as at the time you choose to sell the house, the house value is above where you bought it, then you are net positive. This is not the case with futures. Every day, there is settlement, so if on that first day the value of your $100k worth of S&P dips below margin requirements, you may be forced to liquidate. That said, given the liquidity of the S&P, as long as you don’t hold your contracts for long periods of time without watching you should be OK. Using stops if you intend to hold for a while may also be prudent to prevent a complete disaster. In order to see tick quotes for the E-mini Futures, you will need to subscribe to market data feeds specifically for E-minis (ES). You would need to subscribe to “CME Real-time” to get quotes for ES (S&P) and NQ (Nasdaq). 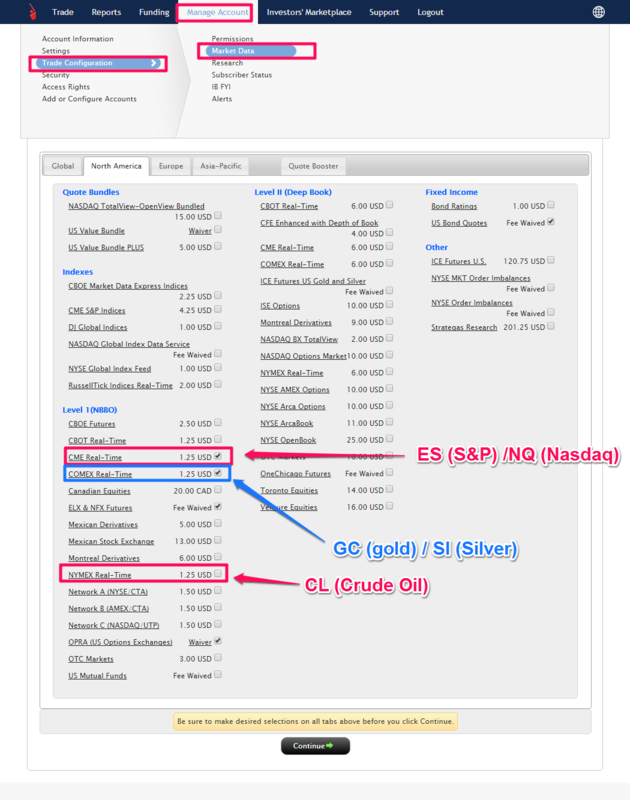 For Gold (GC) and Silver (SI), you would need to subscribe to “Comex Real-Time” – to get real-time quotes for those futures contracts.